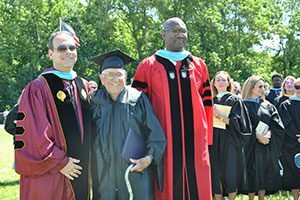 At the Warwick Valley High School graduation ceremony for the Class of 2017 on June 24, the first person to receive a diploma was 93-year old Rocco Garcia of Warwick, who left WVHS after his junior year to fight in World War II. 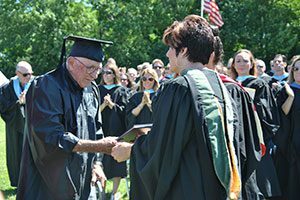 Mr. Rocco Garcia receives his diploma at the Warwick Valley High School graduation ceremony 2017 on June 24, 2017. After receiving his diploma, Mr. Rocco Garcia is congratulated by Warwick Valley Central School District Superintendent, Dr. David Leach (left) and Warwick Valley High School Principal, Dr. Larry Washington.